As a nonprofit fundraising officer, you have so much on your plate as you strategize, organize, and execute your fundraising campaign. You inevitably amass an incredible amount of fundraising data but you may not know where to go from there. The goal of any nonprofit fundraising officer is to understand your donor network and conduct prospect research to identify individuals who will likely help grow your donor base. It is sometimes hard to know which fundraising data is important enough to collect and how to act on what the data tells you. One simple fact remains: properly utilizing fundraising analytics tools to make sense of your data is essential to the health and growth of your nonprofit organization. But how do you maximize your data to make the most informed decision possible? Fundraising analytics in the nonprofit sphere is the process of collecting specific, accurate, and useful fundraising data, discerning patterns and trends over time, and deciding the most effective way to move forward with future fundraising campaigns based on your findings. Leverage descriptive fundraising analytics to classify donors. 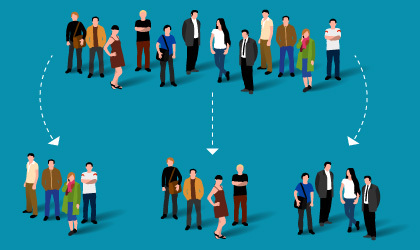 Use predictive fundraising analytics to map out donor relationships. Rely on prescriptive fundraising analytics to make smart strategy decisions. Your nonprofit should take steps to meaningfully engage with the data it has collected to enhance its fundraising capacity through prospect research. If you are reading this post, you have already taken the first step toward finding the best path for your fundraising campaign. Let’s get started and prepare you to take advantage of all your fundraising data can offer! 1. Leverage descriptive fundraising analytics to classify donors. Descriptive fundraising analytics is the foundation on which your fundraising strategy must be built. Essentially, descriptive analytics is used to describe the behavior of your donors and classify them into groups based on their interactions with your nonprofit. Descriptive fundraising analytics can be used to determine many important things, but all of your data should point toward the donor’s capacity to give and the likelihood that they will give to your organization. You can never underestimate the value of having good, clean data in your donor profiles. Classifying your donors into discrete segments will enable you to better understand the data you are looking at. It can be overwhelming to approach your fundraising data when the data does not have any concrete bounds that guide your research. Gift size. How much should you steward a specific donor for? Frequency. How often are people donating to your organization? Their preferred method of donation. Do they prefer to donate online, in-person, or via direct mail? Previously effective fundraising strategies. Do they respond to fundraising events, email, phone campaigns, or direct mail? Location. Are they a local supporter? Age (or generation). What age range (18-24, 25-40, 40-65, above 65) or generation (Baby Boomers, Gen X, Millennials, Gen Z, etc.) do they fall into? Once you have collected this data, you are ready to take your descriptive fundraising analytics to new depths and gather data that is more indicative of an individual’s actual ability and willingness to give to your organization. You should now look at wealth and philanthropic indicators. These indicators are the most important data points that you will gather. While a basic knowledge is important to have so that you can identify certain trends in your existing donor network, wealth and philanthropic indicators are essential if you eventually want to conduct prospect research. Real estate ownership. Individuals who own high valued real estate holdings are more likely to donate charitably. Individuals with more than $2 million in real estate holdings are 17 times more likely to donate to a nonprofit. Stock holdings. Pay attention to individuals who are an officer or director of a company or who own more than 5% of public shares. This will indicate their net worth as well as their important relationships within major companies. Business affiliation. Assess an individual’s estimated net worth and discover their connections that can be leveraged into even more major gifts. However, though wealth indicators are undoubtedly important to collect, they are not the best measure of who you should appeal to in your fundraising campaign. Philanthropic indicators will give a better impression of who is the most strategic person to ask for donations. Past giving. Giving history is the single most effective indicator of whether someone will give to your organization. Record when the individual last gave, how much they gave, and how often they give. Relationship to your cause. Has an individual donated to organizations with a mission similar to your own? Or, have they volunteered or expressed interest in your organization prior to now? Political giving. Individuals who give politically are more likely to donate charitably. People who gave more than $15,000 to the FEC have an equal likelihood of donating a major gift to a nonprofit. Descriptive analytics describes what has already occurred. This is the time where you collect all the data you will then use in predictive fundraising analytics to clearly identify patterns in your donor network. It’s not always easy to collect and organize the correct data, but if you gather information on these indicators, you will be able to take the next step and analyze the patterns among the data points. 2. Use predictive fundraising analytics to map out donor relationships. Predictive fundraising analytics reviews the data you have collected on your donors and attempts to predict their future behavior by finding patterns and trends in the fundraising data. Donation growth. This metric will indicate whether or not your overall donations have increased over a long period of time. This will help you track whether you are meeting your long-term goals and whether or not you need to take drastic changes with your upcoming fundraising campaign. Average gift size growth. Has the size of the average gift experienced an increase or decrease, or has it stayed relatively the same? If you want to see a certain amount of increase in your gift size then this metric will let you see how much more you should solicit from your donors. Fundraising return on investment (ROI). If your organization has a limited budget, it may be useful to measure how much money you were able to raise against how much you spent on your fundraising campaign. Percentage of online donations. Measure how frequently people are using your online donation tools to determine if you can make them more appealing to donors. Online donations are often the most common type of donation because of its relative ease. You also want this number to be high because it is cheaper to steward donors online. Measuring fundraising KPIs will tell you which prospects to prioritize before you start making fundraising strategy decisions. After all, why waste your time pursuing dead ends? If you are wondering how you are supposed to measure these patterns, you need to employ a software tool that will track your data for you. There is no need for you to worry about manually tracking the items on your checklist. You need a predictive fundraising analytics tool that will manage your data for you and compile it into manageable and actionable data sets. Not all nonprofits are alike. You have different needs and different desires that deserve to be met by your software tools. So why would all trend-tracking software be designed in the exact same way? Make sure your portfolio of data is able to have customized fields that you can fill with any information you deem vital to your organization’s success. With this feature, you will be able to examine the data you want without any standard fields getting in the way. Your experience should be as seamless and effortless as possible, and the right software tool will be able to facilitate this. Software tools are meant to make your life easier and to ensure your nonprofit runs as efficiently as possible. Therefore, you should not have to waste time struggling to operate your tool. The best data software tools will have quickly accessible filters that rapidly sort your data according to your specifications without any lag time. This will ensure that you always have the information you need at the tips of your fingers. While the tool will primarily be useful because of its online capabilities, you need to make sure you can download your data. You do not want to find yourself unable to access your data offline. Communication is key when planning a fundraising strategy. If your tool allows you to download your data to Excel, you will be able to view and distribute them as necessary. With the right tool, you should be able to see a visual representation of your data to help you understand what your data is telling you. It is important that your software recognizes that not all individuals understand data in the same way and some may need the visual stimuli in order to make their assessment. Your tool should translate your fundraising data into visuals so that you can physically see the capacity and willingness of people to donate to your organization before you begin constructing your strategy. Predictive fundraising analytics allow you to figure out what your next step needs to be, but you must also utilize prescriptive fundraising analytics to determine how to take that next step. 3. Rely on prescriptive fundraising analytics to make smart strategy decisions. Prescriptive fundraising analytics combine and analyze the fundraising data to create potential plans of action that take advantage of your predictive fundraising analytics results. 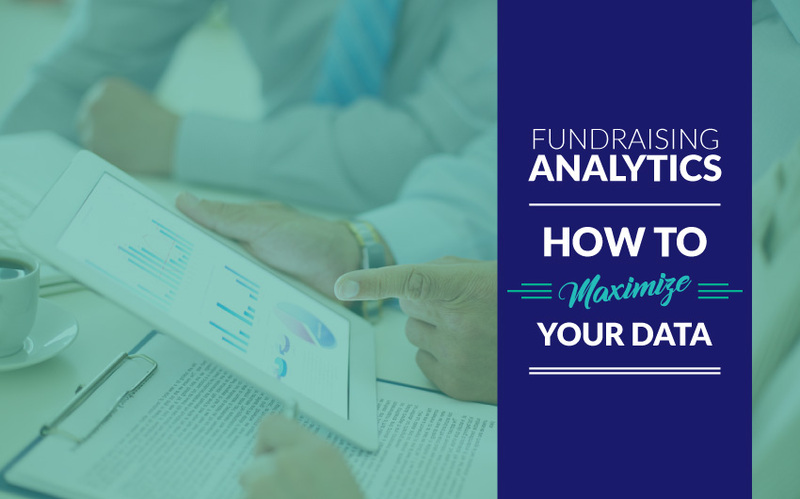 This type of fundraising analytics looks forward and determines what must be done next to help you plan your fundraising strategy. When you are planning your fundraising strategy, you need to know the needs of your organization and how to accommodate them. Prescriptive analytics will help you achieve this. With the right software tools in your toolbelt, you will be able to enter each donor engagement fully equipped with the knowledge of how much you can ask for. This will enable you to maximize each encounter. By the time you have built a firm foundation of fundraising data and analyzed it for patterns and trends, you have given yourself a great point from which to launch your prospect research. 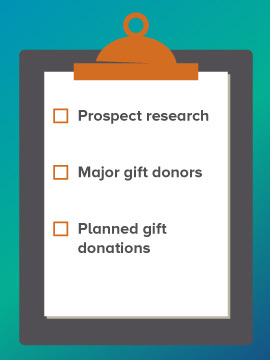 Prospect research adds to your list of existing donors individuals who have a giving history that indicates they will also be likely to donate to your organization. Your donor list is extremely valuable for your organization, but it should not be where your fundraising efforts begin and end. The results from analyzing your existing fundraising data may inform you that something needs to change for you to be able to meet your fundraising goals. If this is the case, prospect research is your best bet for strengthening your fundraising plan. If your prospect generating tool provides information on donors that you think would be a promising lead for you to follow, it should provide additional resource information that will allow you to further study this prospective donor. Once you have fully maximized your resources and enhanced your fundraising campaign’s donor list, you can begin to steward donors. This tool will hone your sense of who you should steward for donations and give you actionable information on new leads. The term major gift may mean different things based on the size of your organization. Your organization may consider a major gift to be $20,000 while another organization may consider a major gift to be $5,000. Regardless of how you define a major donor, these types of donations can be extremely important to the survival of your organization. Over half of nonprofits say that major gifts are necessary to their fundraising, but most nonprofits still don’t have a strategy to deal with major gift donors. Major gifts cannot be ignored. Over 80% of total revenue comes from 12% of donors. Over 5 years of giving. Financial capacity based on wealth indicators. Volunteers or individuals with increased investment in your organization. Don’t let the opportunity to take advantage of a clear major gift strategy pass you by. Use prescriptive fundraising analytics tools to gain insight into the steps your organization needs to take to maximize its fundraising data. Planned gift donors are one of the hardest categories of donations to predict. Planned gifts are gifts that have been arranged and will be donated at a certain future date. These donations are often posthumously donated through a will or trust. 40% of all planned gifts are donated from individuals who do not know the nonprofit’s fundraising officers. You can still steward these donors and cultivate a strong relationship with them through a planned gift program. But, you may not know how to begin to identify these types of donors. 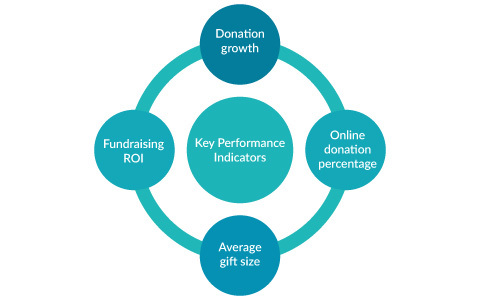 Prescriptive fundraising analytics tools use modeling programs to provide your organization with a list of individuals likely to make a planned gift to your organization. Because of their nature, planned gifts have the potential to be very generous, so make sure you don’t forget to incorporate these gifts into your fundraising campaign strategy. These tools analyze your fundraising data and return actionable information to you. Your organization could not effectively do this without wasting considerable time and resources. Your fundraising data has the ability to revolutionize the efficiency of your fundraising campaign strategy. With the right tools, you can perform fundraising analytics that compiles information, searches for patterns, and provides actionable insights. Don’t let your fundraising data go to waste. Utilize descriptive, predictive, and prescriptive fundraising analytics tools to understand your donors and conduct prospect research. 24 Actionable Annual Fund Strategies (That Donors Love). Ever wonder how to analyze annual fund strategies? Check out this resource with all the information you’ll need to plan effective annual fund strategies. How to Choose the Best Nonprofit CRM: The Beginner’s Guide. To keep your data organized, you may need to utilize a CRM. Read this resource to learn more about how to choose the right CRM for your organization. Prospect Research: The Ultimate Guide. If you still have questions about prospect research, this guide will provide you with all the answers.